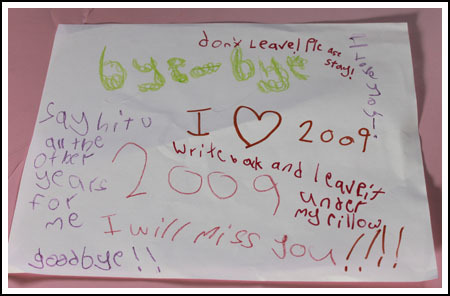 Fuzz wasn’t ready for 2009 to end so she made it a card to say goodbye. We promised her this year would be even better, so Happy New Year and let’s hope 2010 is a good one! Happy New Year to you and your family! Thanks for all of your inspiration, advice and guidance over the past year. Although I don’t always leave comments, I read your blog faithfully every day. And I’m looking forward to seeing what you have in store for 2010! Ahahahah so cute! Guess she had a good time in 2009! May 2010 be even better! Fuzz says thanks for the New Year’s wishes! Katrina, Fuzz was also disappointed that the ball didn’t drop and crash on the crowd. She didn’t say anything about the kissing, but she was strangely fascinated by Kathy Griffin. Love it. I like the “say hi to the other years for me” and “write back and put it under my pillow.” Awesome! My boys were diasppointed when we let them watch the ball drop in Times Square on tv and the ball didn’t actually DROP, crash, break. That’s what they were hoping for. They were really disappointed, then especially when they started showing people kissing in the new year. They thought that was pretty gross. Boys! Happy New Year Anna, Todd and Emma. 2010 holds lots of promise for the Ginsberg family. Need I go further than the new house. Way cool, Fuzz! That is the way to say good-bye to the Old Year! Hope 2010 is super happy for you!